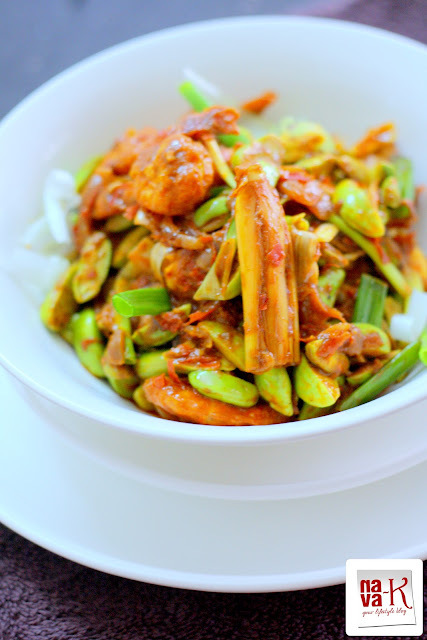 Another marriage matched in heaven our Malaysian Petai (Sambal Sotong Petai), aka Stink Beans dish. Its perfection to our palates when we forcefully or without forcing each other to be together in a sambal spiciness (Sambal Kentang Ikan Asin). Petai and Udang/Prawns (Sambal Petai Udang Kering)? Even Petai and Bilis/Anchovies (Sambal Tumis Ikan Bilis Petai & Sambal Bilis Petai)? Where are you petai lovers? Are you not agreeing with me? 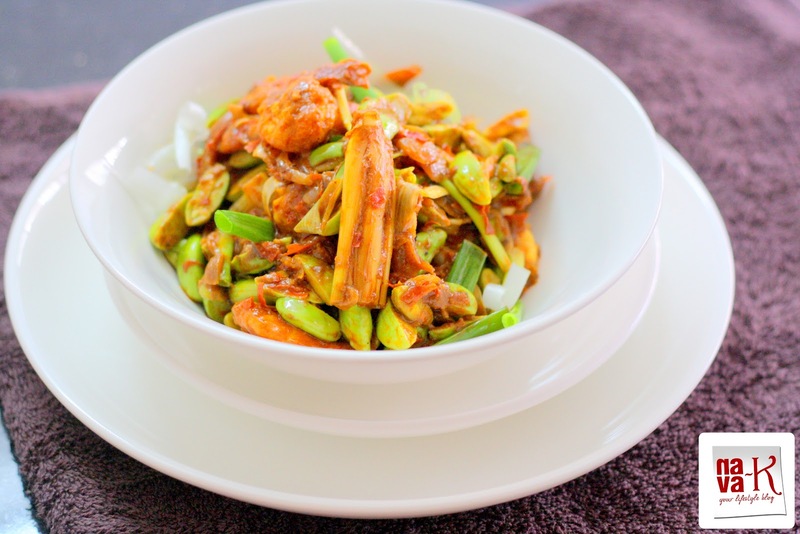 I bet you love any of these combination of petai and of course, how can we cook petai, as I have already told you without chillies (Sambal Udang/Prawn)? Henceforth, to make this Sambal Udang Petai, essentially, in fact you must buy the freshest prawns (Prawn Noodle Soup, Devilled Prawns & Bitter Gourd Prawn Curry). Otherwise, you are wasting your time and your money. Make sure you checklist the prawns first (Chinese Prawn Fritters, Prawn Mango Curry & Sichuan Chilli Prawns) whilst picking up the petai. When petai is a concern for me, I usually buy those already peeled and sealed in the plastic for time saving and instead of adding the pieces just like that, I slice. Why do I slice the petai? Because of the probability of wriggly worms playing sparks inside. Thereafter? Go ahead. Replicate or tweet this recipe of mine. Mix prawns with turmeric powder and cornflour. Heat enough oil and when heated, fry prawns till crispy and cooked. Drain excess oil and leave about 3 tbsp in the same wok. Add chilli paste, onion rings and lemongrass. Stir as and when needed till aromatic and oil splits. Pour tamarind juice and season with salt and sugar. Stir and add in prawns and petai. Garnish with spring onions before serving. I am wondering now what those beans would look like in the market. they got any other name? I go with Uru, you call them stinky beans but the dish looks really flavorful. Do they smell even after cooking? I could eat prawns with anything, even stinky green beans. heh. this looks great, nava! Nava, u got me sold with just prawns & lemongrass! So yummy! But I'd probably throw away those stinky beans. Lol! Oh wow, petai sambal!! My mom and dad love it. Unfortunately, I never developed any taste or liking for it.